Specialized Bolts, Screws and Nuts – PTP is a leading aerospace fastener manufacturer, producing an extensive array of screws, bolts and nuts. We manufacture parts for Pratt & Whitney, GE, and other Tier 1 customers. These specialized parts often require custom head configurations and critical threading processes. With an innovative, highly experienced team, superior quality, and leading-edge manufacturing capabilities, PTP excels in processing parts for demanding aerospace applications in stainless, alloy, and superalloy materials. Ferrules, Pins and Bushings – These critical components for aerospace fasteners are a PTP specialty. 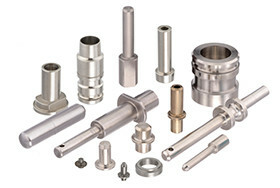 We offer knurled, threaded, stepped, and shouldered pins, as well as headed and headless slip and press fit bushings. 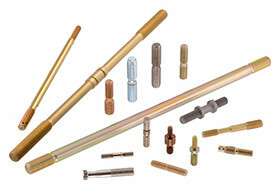 PTP also supplies a wide variety of standard and custom ferrules to meet customer requirements. All PTP aerospace fasteners can be machined to a tolerance of ±.0002 in your choice of materials. Shouldered Studs – PTP produces large quantities of custom and standard MS and AS shouldered, stepped, hex wrenching, and drilled studs, maintaining pitch diameters to ±.0002. These studs are expertly produced on PTP's Swiss CNC machines; threads are rolled on advanced thread rolling equipment. Shouldered studs are produced with wrench flats up to 1 inch, lengths up to 10 inches, and in thread length configurations to meet any requirement. 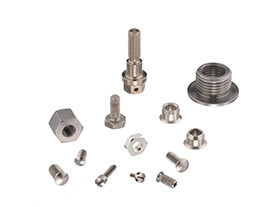 As with all PTP aerospace fasteners and fastener components, we can accommodate stainless, alloy or superalloy specifications. Contact PTP for a quote today!